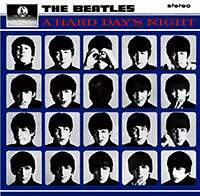 In 1964 the third Beatles LP was released titled A Hard Day's Night which contains - on the contrary of the previous two Beatles albums called Please Please me and With The Beatles - only Lennon-McCartney compositions. The title is Ringo's "creation" which he comitted by chance during the shooting of their first movie with the same title. After a long day Ringo went outwards from the studio and said "It's been a hard day", eventually he got out and realized it's night, so he added "It's been a hard day's night". John Lennon riding home with director Richard Lester noticed that (as he called it) Ringoism who seized the moment and said they'll use that as the title of the movie and album. On the album George Harrisons guitar play is dominant and typical which was played with his legendary twelve string Rickenbacker 360/12 guitar ispiring folk musicians and contributed the 1965 folk-rock boom. It also had to be mentioned that The Beatles pioneered the way to the US and the so called Bealtemania spread and became as known as British Invasion. The Beatles opened up the US's closed doors to the Brit music for bands such as The Rolling Stones, The Who, The Kinks, The Animals and inspired US bands like The Lovin' Spoonful. The movie called A Hard Day's Night also had influence on audiovisual culture and TV which resulted bands making music videos called as "pop promo" which were the ancestors of nowadays' video clips. The LP was voted the 5th on the "best British LPs of all times" by Q magazine and was voted 307th as the "500 best albums of all times" by Rolling Stone magazine in 2012. A Hard Day's Night was released exactly 50 years ago. Thus The Bits European Beatles Supergroup plays the entire LP live on stage celebrating this anniversary insisting the original sound and feel just how it sounds on the record player. The Bits endeavour to bring back - besides the original arrangement - the exact vocal performance as well compounding the legend with the magic of live music hence completing the Beatles impression in 2014's Bits adaptation. 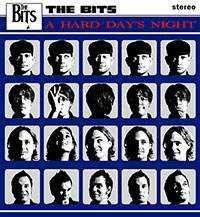 During 2014 The Bits are going to perform the A Hard Day's Night Live in several countries Europewide.